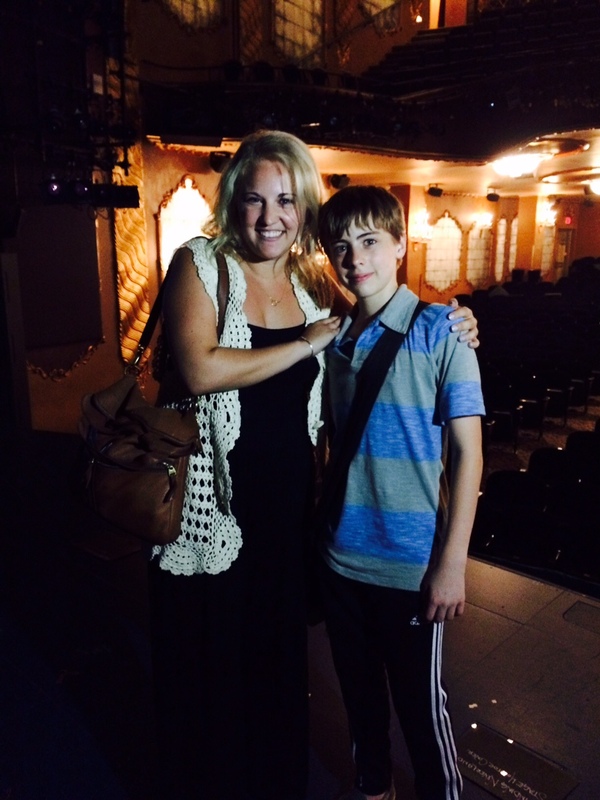 Finding Neverland with Jackson Demott Hill! 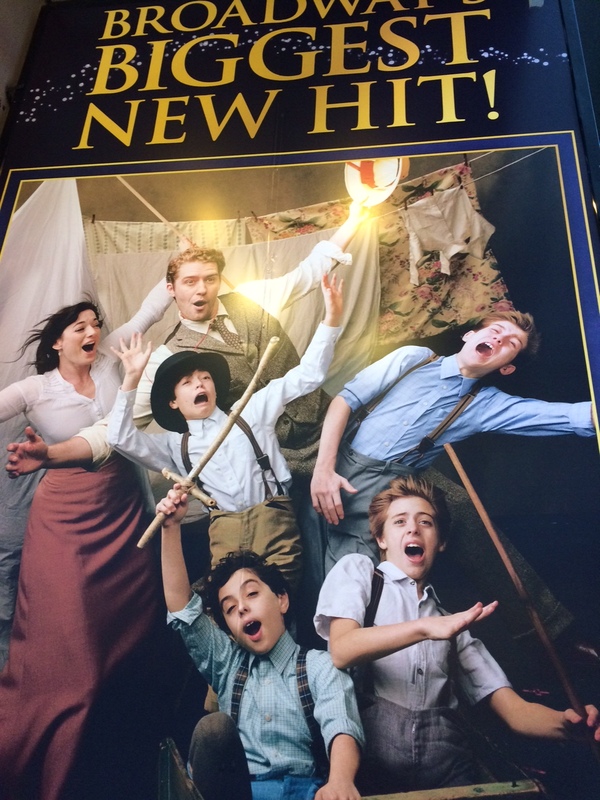 Jackson and cast on the wall outside the theater! I finally had the pleasure of seeing our student Jackson Demott Hill in Finding Neverland this weekend and it was SO GOOD! The show itself was magical and the experience of seeing Jackson up there left me breathless! I was giddy and teary-eyed the whole time 🙂 After the show I met him outside and got a chance to watch him sign autographs for his hoards of fans! And then he took me on a backstage tour of the sets, props, stage, etc and was an excellent tour guide! Overall, the experience was just fantastic and you should all go see it! Right now, we are only getting his schedule about a week out from the performances but I will try to post them to the Wingspan Facebook page as we get them so you can try to get tickets to a show he will be in. Below are some photos of the evening! 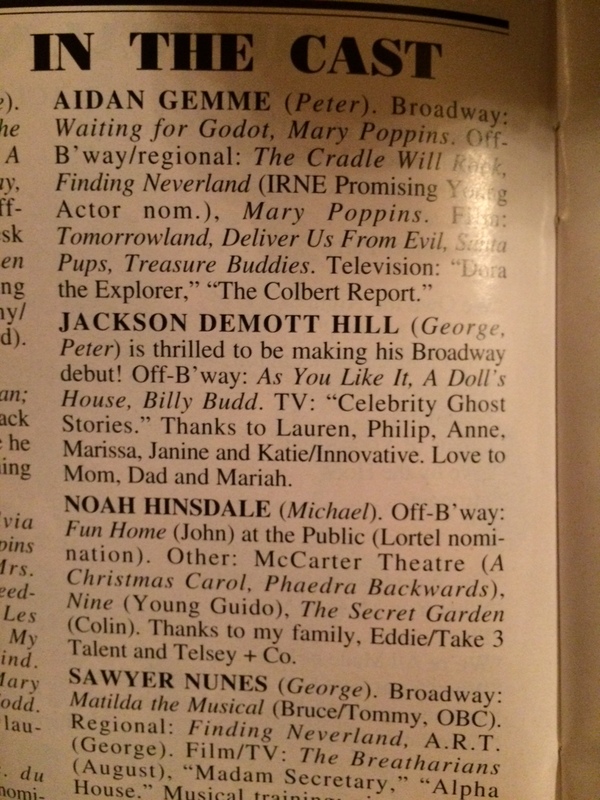 Jackson’s bio in the Playbill! There are exciting things happening over here so we thought we would share! 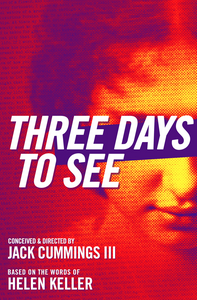 Our very own Zoe Wilson was just cast in the Transport Group’s upcoming production of Three Days to See. Head over to this site for more information and to get tickets! We will miss her at Conservatory this summer but we are SO excited to see her shine in this cool new show! 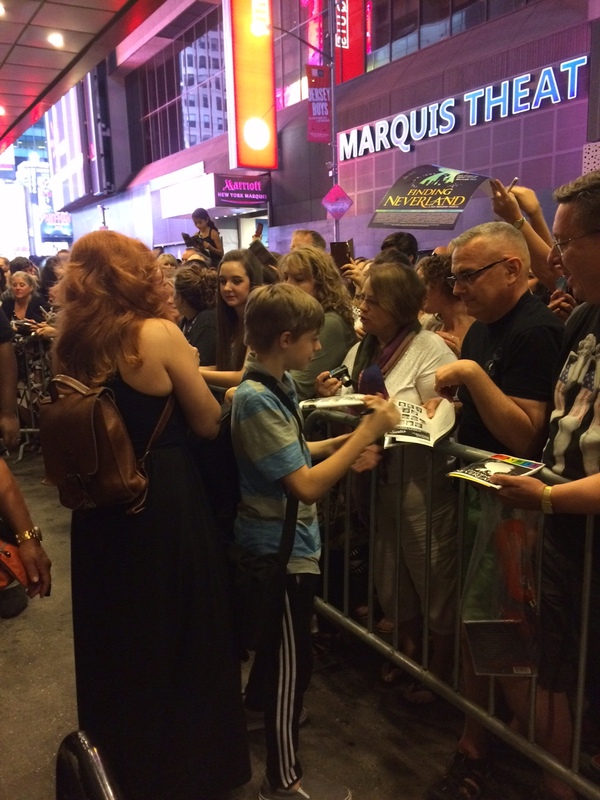 Jackson DeMott Hill made his official Broadway debut on May 13 in Finding Neverland and since then has been going on a few times a week! We are so excited for him and can’t wait to see the show! Frank will be attending Marymount Manhattan this fall to study musical theatre! Amanda will be attending NYU to study both Theater Performance and Educational Theatre! Dylan will be spending her first semester studying abroad in London with Arcadia College. When she returns she will be spending the rest of her college career at Brandeis University! Gigi will be attending Lynn University in Boca Raton, Florida to study English and Drama! Samantha is headed to Boston University! Will will be attending Columbia University! He is also currently working on his music company, Nada Bird LLC, that he started with his friend! Martha will be attending Connecticut College (along with Gaby)! We are so excited for all of our seniors and wish them all the luck in the world as they head off on this exciting new chapter of their lives! That is all of our news for now but stay tuned as we gear up for Summer Conservatory, starting on July 6th!